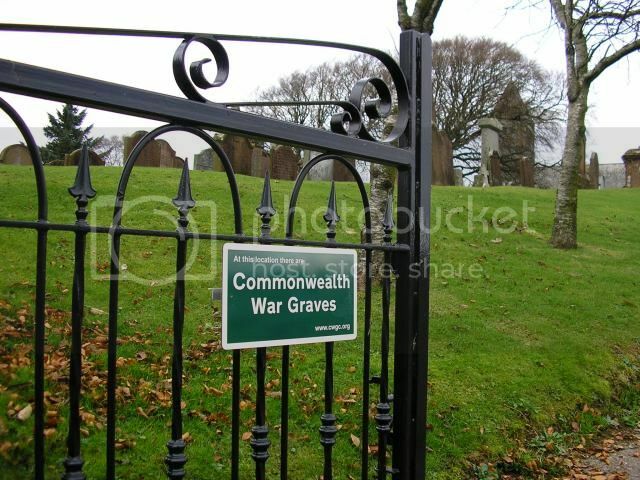 Following an agreement between CWGC, Dumfries and Galloway Council and (where appropriate) the Church of Scotland, War Grave signs are beginning to appear at the entrance to burial grounds across the county. This is from my local parish churchyard of Colvend in Kirkcudbrightshire. I have seen several of these signs around the country. Just wish they would state how many War Graves are actually in the cemetery. It might help locating them for photography purposes. CWGC have been marking cemeteries / burial grounds containing war graves in UK with these signs for a couple of years now. They are similar to those in place overseas for many years. As you rightly point out, this is done by agreement with the relevant authority / owner involved. This is a major project for CWGC. I understand it is much easier for them erect the signs in Scotland, than in England, due to way our cemeteries / burial grounds are looked after. Signs at around 500 of the 1,200 of the locations in Scotland are already in place. Just wish they would state how many War Graves are actually in the cemetery. It might help locating them for photography purposes. The number of war graves is easily found from the CWGC record. Assisting photographers / researchers is not one of CWGC's obligations. I guess it would make it too expensive, Morag. This churchyard has only one war grave but the sign does indicate more. They may have been about for while Jim but we live at a different pace down here on the south coast - s...l...o...w.
That may well be true, but I expect getting the necessary permissions has a bearing on it. "The number of war graves is easily found from the CWGC record. Assisting photographers / researchers is not one of CWGC's obligations." I wasn't for one moment suggesting anything of this nature. Quite often I come across cemeteries with these signs when I have no information with me. I still go looking on the off chance of finding and photographing the gravestones and then checking when I return home. Easy then to delete from the camera if they have already been done and better to post if not. i've seen a few of these now. I think we're a long way from having Q.R. code panels with casualty info like they're rolling out in the larger wargrave cemeteries on the continent. But in time i suppose they'll come too. Don't want any of that modern stuff down here Derek. Can't stop, I'm just off to change the gas cylinder on my internet connection. CWGC are are already placing these larger information panels at significant locations in UK with 10 in Scotland. One is already at Edinburgh Comely Bank and these have a QR code on them, as you describe. Assuming you get a signal this provides info on the cemetery and the casualties buried there. Och - where's the fun/challenge in having them all pinpointed? Personally, I like to meander through cemeteries and yes, having a list of the CWGC ones is handy, but then you might miss all the family ones. You still have to find them. I will resist commenting on family graves being listed as war graves on this site. The family graves you're 'resisting' commenting on? Don't you agree with them being added and if so, why? Morton Cemetery;, Penpont Churchyard; Closeburn Cemetery & Churchyard; Glencairn Churchyard; Dunscore Churcyard & Cemetery all have cwgc signs on gates. On 2/4/14 two special services are going to be held in Thornhill and Penpont, arranged by Mr J. Stuart Mill Minister of Churches. With a rep from cwgc, members from Legion and other interested parties. 2.30PM At Morton and 3.30pm at Penpont. I shall be in attendance myself. What are the special services at Thornhill and Penpont for? The special services are to honour the fallen who lie there and to remember their sacrifice. Also to show everyone where all cwg's are. I have made wee file showing plan of graves and notes on each person - so that all can read.